Four days ’til our final inspection. Our last two tradesmen (for [phase 1A][phases]) were out today–masonry and HVAC. Kevin McKeever is our mason. He came out yesterday to salvage as many of the old bricks from our original chimney as possible. 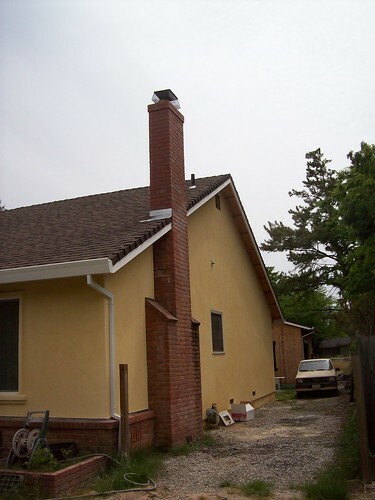 This morning he and his assistant built the chimney up about seven feet, installed the counter-flashing and chimney cover/spark arrestor. They mixed the old bricks in with new ones, and it blends very nicely. José Miranda (of Alpha Services) is our HVAC contractor. 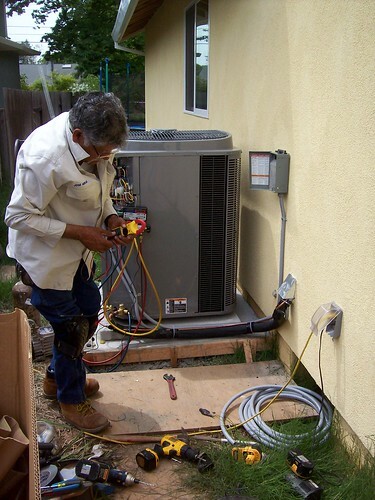 He came out today to install the A/C condensor–I was surprised at how much work was involved in this process! The copper pipes between the attic and the condensor were filled with nitrogen, soldered, evacuated, then filled with refrigerant. The unit is powered by a 40 amp circuit and code requires a power cutout box, so: mount the cutout box to the wall, wire the circuit up to one side of the box and the unit to the other side. The control circuit was wired to the condensor (outside) and the FAU (in the attic). Finally, José tested *everything*. (IIRC, testing alone took most of an hour.) For the first time since this house was built 60 years ago, it now has central heating *and* air conditioning. The weather is too mild for either heating or cooling right now–it’s about 72°F, so I guess we’ll have to wait for a heat wave to really test the A/C. Meanwhile I’ve been busy myself. I got the dishwasher bolted into its cabinet last night. It was a lot tougher than I thought it was going to be, because I couldn’t get the darn thing plumb and level. I finally realized that either the power or water line wasn’t in its proper place, so when I tried to lower the back of the unit it was getting stuck on the water or electrical line. We pulled the unit all the way out of the cabinet, taped both the water and power lines in place on the back of the unit, and slid it back into the cabinet. 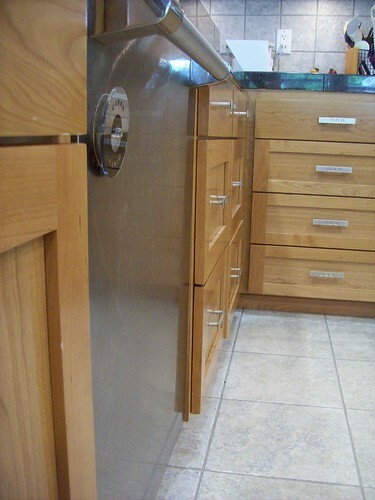 After that the adjustments were easy, although the cabinet opening is just a little too short (maybe 1/8″) for us to get the dishwasher *perfectly* plumb. But it’s pretty darn close. I also got one of the attic fans finished. The other one is mounted in the gable, although it’s currently wired with a temporary appliance cord. The important thing is that they both work. They’re keeping the attic much more tolerable and extending the time I’m able to work up there. I should have no trouble finishing the other tasks in the attic this weekend. * Finish installing second attic fan. This entry was posted in Our home remodeling project, Uncategorized and tagged attic, hvac, kitchen, mason. Bookmark the permalink.